2016: The Year of the Digital Health Bubble? Launching a successful startup is challenging enough as it is, but in healthcare, with regulatory issues, compliance, data security, interoperability hurdles, and unique economics tied to reimbursement, it makes for a lot of inertia to overcome to be a true disrupter. Unit economics pose an additional problem for digital health startups. “This is particularly true for digital health plays in the direct-to-consumer and on-demand space, where reimbursement is still murky, distribution and marketing costs are high, and patients are not used to paying out-of-pocket,” the CB Insights stated. Amidst these challenges, the promise of the digital health gold rush has led to investors to flood the market. According to RockHealth, 2015 was another year of big numbers for digital health— as the year closed out with over $4.5B in funding flooding into the space, a sizable increase in the number of later stage rounds, and 187 M&A deals. However, just last year, an Accenture study proposed more than half (51 percent) of all digital health startups are likely to fail within the first two years, a sobering outcome given the level of investment in digital health. As John Lynn from EMR and HIPAA mused after his visit to CES: All I could think about as I walked through the incredible number of digital health solutions at CES was “Not all of these can survive.” In past years at CES it felt like a number of players with some overlap and some competitive pressures, but that there was plenty of pie for everyone. This year has me wondering if that’s still the case. 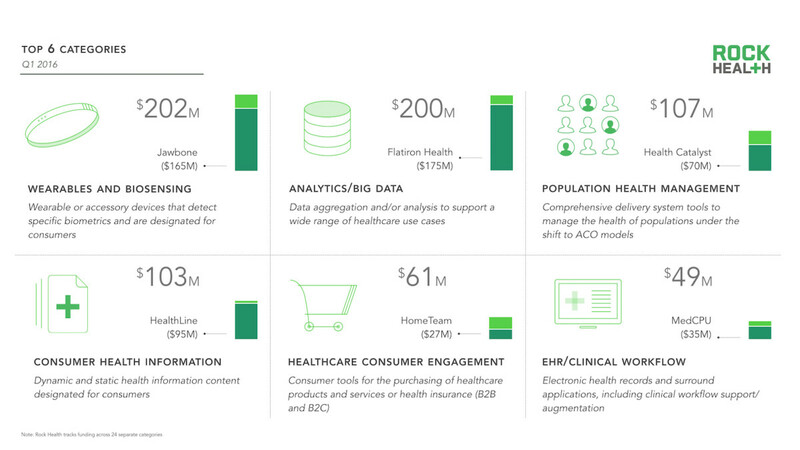 Examining HCO buyer trends, HIMSS Analytics published a study, listing the 17 growth technologies in hospital purchase plans in 2016, with data warehousing/mining – clinical, medical necessity checking content and dictation with speech recognition topping the list. Missing from this list are many of the items from the aforementioned digital health funding list. 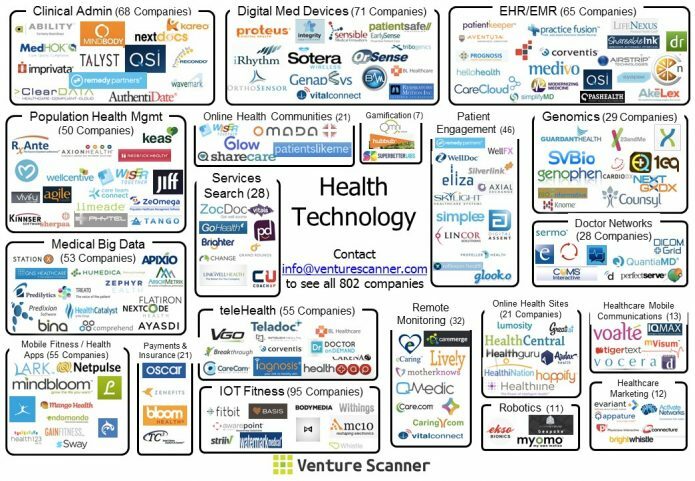 This begs the question, are digital health startups providing solutions that HCOs are ready to invest in? Outside of wearables, it’s arguable that the true buyers are healthcare organizations, not the consumer/patient. Are these HCOs prepapred to invest in patient engagement? It seems that solutions for patient to provider communication are lost on the already inundated providers who are struggling through workflow and optimization initiatives. Further compounding this issue, Healthcare Finance News recently published that facing a fragmented market, many healthcare organizations are tackling pop health projects without purchasing IT tools specific to the task. It sells policies only on insurance exchanges, which have enrolled fewer people than expected. It’s getting stuck with sicker patients with expensive pre-existing conditions whose coverage is guaranteed by ACA. All insurers are realizing that they priced their exchange policies too low to break even, although Oscar’s competitors have the advantage of being able to make up their losses elsewhere. “2015 was the year digital health funding hit its stride, and 2016 has already stepped it up a notch with a record-setting first quarter,” postures RockHealth in their Q1 2016 Insight. “Signs continue to point to a market transitioning from something reminiscent of the Wild West to the early stages of maturity.” Even with this optimism, it appears that more attrition and M&A are on the horizon as digital health startups look to gain efficiencies through economies of scale and grapple with value proposition relevancy in a fragmented and crowded marketplace.